Dr. Mitsy Navales-Antolin received her degree in dental medicine at the University of the East College of Dentistry in 1995 and received the Best Dental Clinician Award. She took her post graduate training at the Department of Pediatric Dentistry in Aichi-Gakuin University, Nagoya, Japan. In her pursuit for academic excellence and clinical expertise, she has attended various seminars locally and internationally both in the field of pediatric and cosmetic dentistry. She a renowned educator, giving lectures around the country on the latest advances in her field. 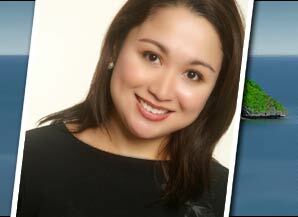 Dr. Navales-Antolin holds a Dental License both in the Philippines and in the State of California, USA. She is a member of the American Society of Cosmetic Dentistry. She is committed to dental excellence and is passionate about providing her patients with the best dental treatment throughout their lifetime. * For PERIODONTICS and IMPLANTS: We refer our patients to different US trained dentists and their respective dental clinics.
" Passionate and Committed to dental excellence "
Site design by Geronimo Photographico © 2006 Navales Dental. All rights reserved.